I am very pleased to present the inaugural post of Platter Talk’s newest feature, Guess Who’s Coming to Dinner. 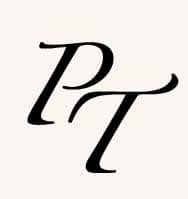 Here, I hope to introduce to the readers of Platter Talk, a host of talented and seasoned kitchen artists who will provide a unique insight into the culinary world as seen from their own cutting boards, stove tops, mixing bowls and ovens. I’m honored to introduce to you as my first guest, Mary Bostow, the lady behind Bunny’s Warm Oven. One look at her work and it’s obvious to all that Bunny not only is full of great baking ideas, she also is loaded with culinary skills and talent. 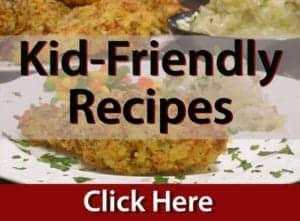 Her facebook page is filled with wonderful creations which all link back to the recipes on her blog site. I hope you will visit her page, give it a “Like” and be sure to mention that Dan sent you. Before we get started, I had a few questions for our guest. Platter Talk: Bunny, What is one of the creations that you are most proud of? Bunny: When i was in a blogger baking group called The Daring bakers I made a Danish from scratch, it was an amazing experience, I loved it! Platter Talk: What is your goal as a food blogger? Bunny: I want the people that come to visit me to love baking as much as I do. I want them to not be afraid of tackling anything and enjoy what they learn while they do it. Platter Talk: Do you follow any cooking shows on television? Bunny: The only person i ever really followed was Paula Deen. I love her enthusiasm for what she does. And at the end of the show when she took a bite of what she made, you could see how much she loved it and I wanted a bite too! Platter Talk: Have you ever met a famous chef? Bunny: Not in person but I have many chefs as friends on facebook. Platter Talk: What is your favorite cooking implement? Bunny: That would be the Queen, my Kitchen Aide mixer! I don’t know what I’d do without her! Without further ado, I am very proud to introduce to you Mary Bostow, the lady behind Bunny’s Warm Oven. Before we get to this little treat I’d like to say how honored I am to be guest posting on Platter Talk! As y’all know Dan is extremely talented in the kitchen and a friend to all and it’s my pleasure to call him my friend. Thank you so much for inviting me over to your house today Dan! 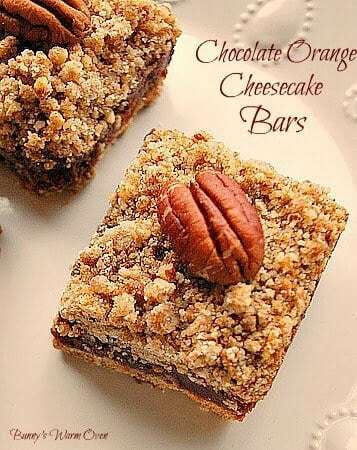 Chocolate Orange Cheesecake Bars… The flavors of chocolate and orange have been a long time favorite of mine and one of the reasons I wanted to make these bars. I’m also a big fan of combining crunchy and smooth textures together. I just couldn’t resist making a bar with all these delightful flavors and textures together in one recipe. 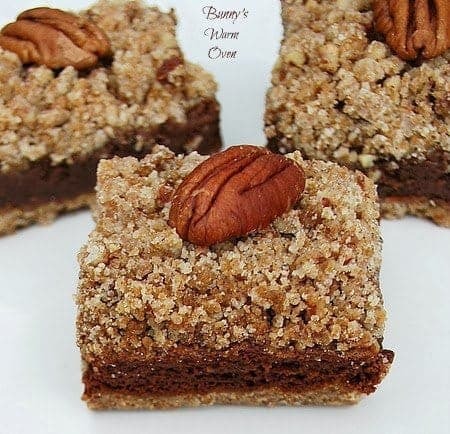 Upon your first bite your mouth has the pleasure of the slight crunch from not only the topping but the base of the bar as well. The smooth chocolate orange cheesecake filling works it’s way onto your taste buds and you can’t help but think….mmmmmm that’s nice. I loved that this bar was made in a 9 inch square pan, it was just enough for Paul and I to enjoy. A perfect little dessert for after dinner coffee when you want a little something sweet to round out your meal. These bars came together quickly…and left that way too! I’m a big fan of Hershey’s recipes, if anybody knows chocolate, Hershey does. I hope you enjoy these as much as we did! Be Sure and Follow Platter Talk on Facebook and Never Miss A Great Recipe! Click Here to “Like” on Facebook! Stir together flour, brown sugar and cinnamon in large bowl. Cut in shortening until mixture resembles coarse crumbs. Stir in chopped pecans. Reserve 3/4 cup flour mixture. Press remaining mixture firmly onto bottom of ungreased 9-inch square baking pan. Bake 10 minutes or until lightly browned. Beat cream cheese and sugar in medium bowl until fluffy. Add cocoa, milk, egg, vanilla and orange peel. Spread over warm crust. Sprinkle with reserved flour mixture. Press pecan halves lightly onto top, if desired. Return to oven. Bake 25 to 30 minutes or until lightly browned. Cool; cut into bars. Cover; refrigerate leftover bars. About 24 bars. Be sure and Keep up with Bunny’s Work! Follow Bunny on her Facebook page by clicking here, please give her a Like and share her work with your friends! Thanks Stacy. We love your comments. Hope you have a great week. Dan, these sound so good, I would love to make these at my next neighborhood gathering. Great idea! Let us know how they came out. I am sure they will be a big hit. Great feature! This will be fun. And these Chocolate Orange Cheesecake Bars? Even better! Really fun post – thanks. Thanks, This was a fun post to put together. They look so good and are so beautiful. I will have to try these. Please do give these a try, they are delicious. That is a great interview. Bunny has wonderful recipes; I especially love this one at the moment. 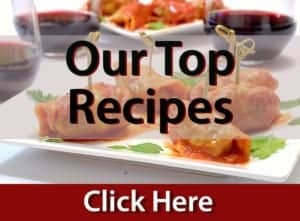 I’m glad I found your site too; I am going to love finding new recipes I can share with my family. Thanks for Platter Talk ; it’s a great idea and I look forward to seeing what’s in store in the future . Thank you so much for stopping by. We hope to see you back very soon. It’s a pleasure to meet Mary and her post for PT’s new series is scrumptious looking. Thank you for the introduction, Dan. She’s got a knack for combining flavor and texture; the hallmark of a seasoned baker. Upon perusing her place, the Oatmeal Carmelitas are to die for and the Blueberry Coffee Cake has my name on it. GWCD is a terrific addition, bravo! I appreciate hearing from you and am happy that you share my adulation of Bunny. I look forward to having you to dinner, in the near future! Best to you, my friend. These look and sound so delicious, I also clicked over to Bunny’s Warm Oven and started drooling all over my keyboard! Thanks for sharing! Thanks for stopping by and yes, I agree, Bunny’s stuff does cause drooling! Have a great weekend!